Generator Service is essential when you own a Generator! Book Your Generator Service today! We service all brands, makes & models so whether it’s a breakdown or regularly servicing you require, Generator Power has the expertise and experience to keep you up and running 24/7. At Generator Power, we recognise the need for regular and professional generator service. Whether in continuous use or as backup solutions, regular and proper maintenance averts costly breakdowns and downtime. Wearing down of generator parts is something that you cannot avoid but you can prevent it from inconveniencing you. The best solution, ensure you have an expert regularly service your generator to prevent breakdown. At Generator Power we have an experienced team of technicians inhouse and on the road, ready to attend to your generator needs 24/7. We can offer you peace of mind with our extensive range of Maintenance and Repair Services that will have you back up and running in no time, keeping your generator system running at maximum efficiency. Load Bank Testing of UPS Systems, Generators & Power Proving Tests. Latest technology equipment including Cummins InPower and Himoinsa control system software. Diesel generator sets – must be regularly serviced to provide reliable power throughout their operating life. 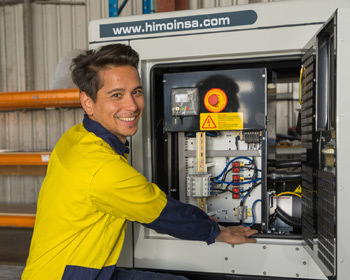 Let us customise your generator maintenance plan to ensure you get the best service life out of your equipment to ensure a reliable power source. Be kept up to date with detailed documented reports including recommendations for scheduled repairs and future upgrades from our experienced service technicians.